Kick your feet up and relax outside with the Rectangular Ottoman. The ottoman is perfect to add to your outdoor space allowing you to put your feet up or giving you an additional seat when entertaining. The Berkshire Rectangular Ottman by NorthCape International at AHFA in the area. Product availability may vary. Contact us for the most current availability on this product. 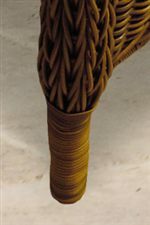 NC4182O Ottoman Frame 1 33" 20" 17"
Construction Durable resin weave over sturdy commercial grade aluminum frame. 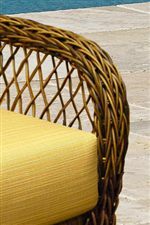 Indoor/Outdoor wicker, weather and UV resistant. Maintenance Maintenance of the frame and fabric is easy and the pieces can be cleaned with mild soap and water. Feel like you have escaped away to a luxurious resort while relaxing in your own back yard. The Berkshire Collection features a variety of lounge seating and dining to complete your outdoor space. All weather wicker thick frames with a rich Cappuccino finish are stunning making your friends envious. The open weave keeps each piece feeling light and breezy. Traditional features include rounded arms, pointed legs and a skirted design. Bring your living space outdoors with the Berkshire Outdoor Living and Dining Collection. The Berkshire collection is a great option if you are looking for Traditional Outdoor Furniture in the area.